Gardening doesn’t have to break the bank, as long as you use what you have and let nature take its course. From saving water in the garden to low-cost garden ideas, here are top tips on how you can maximise your garden growth and still save money. If you have agapanthus, daylilies, wild iris and gazanias, discard the old central core and replant or pot up the outer sections. In this way, one old plant can be split into as many as twelve new plants to replant in your garden, or to swap with your neighbours for other plants. Instead of looking to metal supports to stake tall plants that are susceptible to wind damage, opt for natural, inexpensive alternatives. These could include bamboo or any other straight and sturdy branches from your garden. 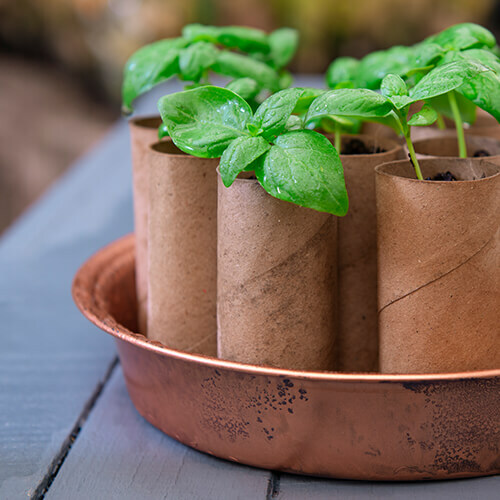 Using eggshells as planters is a fun activity for both kids and grown-ups, and recycled toilet paper rolls or egg cartons are perfectly shaped to sow and grow seedlings. Once your seedlings are big enough to plant out into a bigger pot or your garden, simply plant in its container – it’s biodegradable and will add nutrients to the soil. These can come in handy as water-retaining material in your hanging baskets and containers. Break up the oasis into smaller pieces and mix in with the potting soil to retain moisture for longer. These are ideal for lining small hanging baskets. They’ll keep the soil in, but will allow water to drain out. Wood ash (don’t ever use ash from charcoal) is high in potash and is a good feed for flowering and fruiting plants. Growing new and healthy plants via propagation techniques such as cutting, seeding and runners is not only a cost-efficient way of growing your existing plant collection, but is also a highly rewarding activity. Choose drought-resistant plants such as Ericas, acacias, lavender, succulents and kalanchoe. Use low-growing waterwise groundcovers – these keep your garden beds moist and cool. Water plants deeply to encourage the roots to grow deeper and utilise the moisture in the ground. This enables the plants to thrive between waterings and in times of drought. Mulching your beds with bark, pebbles or gravel reduces water evaporation from the soil surface, so there is more water for the plants to absorb. Organic mulches such as grass cuttings, compost, straw, nut shells and shredded newspaper can also be used with excellent results. Collect and harvest rainwater with household containers, rain barrels and rain chains. When trimming your lawn, leave it at a height of at least 3–4cm so the blades of grass can shade each other, reducing water loss.